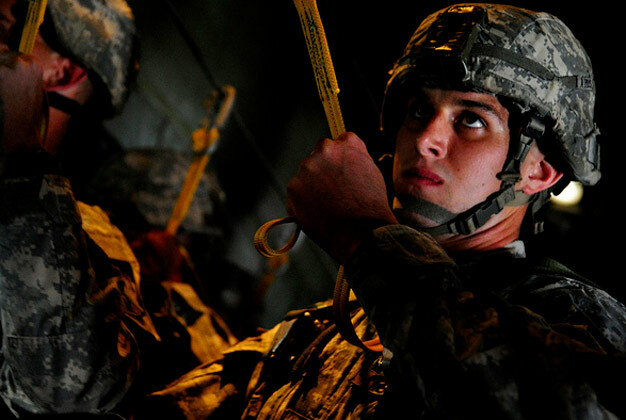 U.S. Army paratroopers assigned to the 1st Battalion, 505th Parachute Infantry Regiment prepare to conduct an airborne insertion from a C-130 Hercules aircraft assigned to Little Rock Air Force Base, Ark., during a joint forcible entry exercise at Pope Air Force Base, N.C., on Sept. 12, 2010. A joint forcible entry exercise is a large-scale heavy equipment and troop movement exercise conducted by the Air Force and the Army. DoD photo by Staff Sgt. Angelita M. Lawrence, U.S. Air Force.